Only George Washington Could Interrupt This Vision of Liberty! Take a look at the quarters you have in your pocket or change tray, and you’ll see the old standard -- the left profile of George Washington as depicted by John Flanagan. But did you know that this design, soon to enter its 85th year, was only meant for one year of use? Washington’s profile was first used in 1932 to commemorate the 200th anniversary of his birthday, and after its initial run, the design stuck. However, before a founding father graced the heads of the quarter, a different vision carried the U.S. through the First World War to the Great Depression. The year was 1916, and the U.S. was on the brink of global conflict. World War I was raging in Europe and the 1915 sinking of the British ocean liner RMS Lusitania by a German U-boat was still fresh in the public consciousness. President Woodrow Wilson tried to keep the U.S. from getting involved in a bloody, brutal war by trying to facilitate peace between the warring nations. However, the nation’s collective attitude was turning fast away from isolationism to a more active role in protecting the U.S. from threats, both present and future. It was the right time for the nation’s coins to capture this feeling -- the desire for peace, but the capability and willingness to defend. 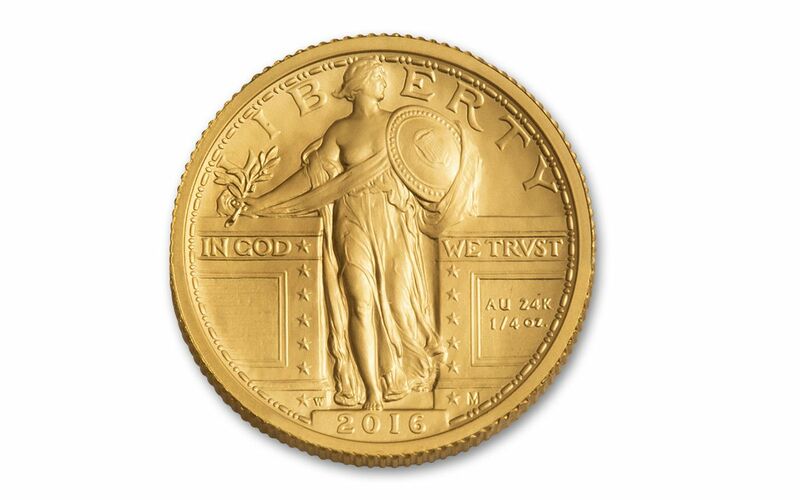 So, when the U.S. Mint was looking for the right way to symbolize a nation on the threshold, it found its vision in the work of Hermon Atkins MacNeil. In his creation, Liberty stands in the middle, bookended by two by two waist-high walls. To her right, an olive branch of peace underneath an exposed breast of fertility. On her left, a shield and a directed, watchful gaze that is on dutiful guard. The symbolism is strong, and for a nation that was about to be forever changed by war, suffrage and temperance, a powerful reminder of this country’s basic tenets. Aside from the covering of Liberty’s chest with a plate of armor in 1917 (the same year the U.S. entered WWI), this design remained unchanged until the Great Depression took its full toll in 1931. When the mint needed to produce quarters again in 1932, the time was right to commemorate Washington’s birthday. The rest, along with MacNeil’s original design, is history. Now, Hermon Atkins MacNeil’s original 1916 design has returned for a limited engagement. 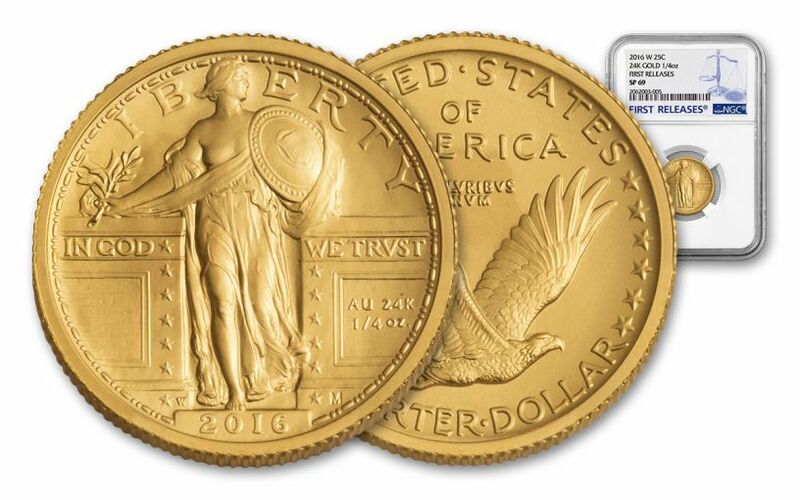 As the second in the U.S. Mint’s Centennial Gold program of classic design re-releases, this 2016 Centennial Gold Standing Liberty Quarter joins the previously released Mercury Centennial Gold Dime and the soon-to-be released Centennial Gold Half Dollar. 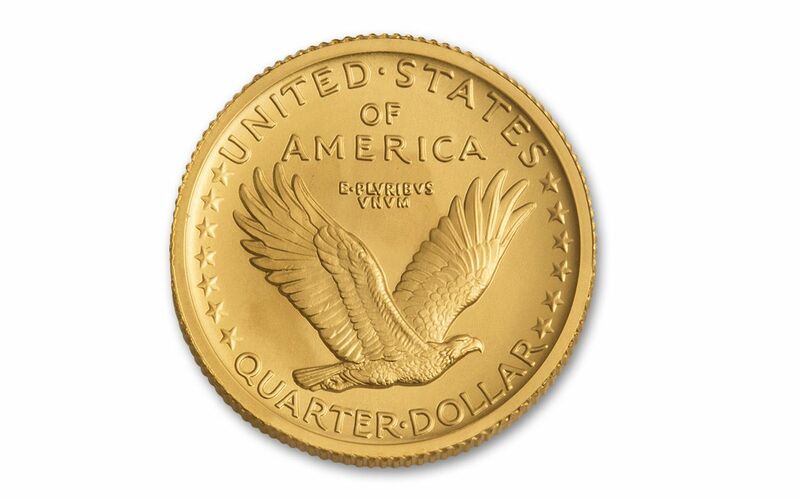 Recreated in one-quarter ounce of 99.99% pure gold, MacNeil’s classic design is paired together with a bald eagle in flight on the other side. 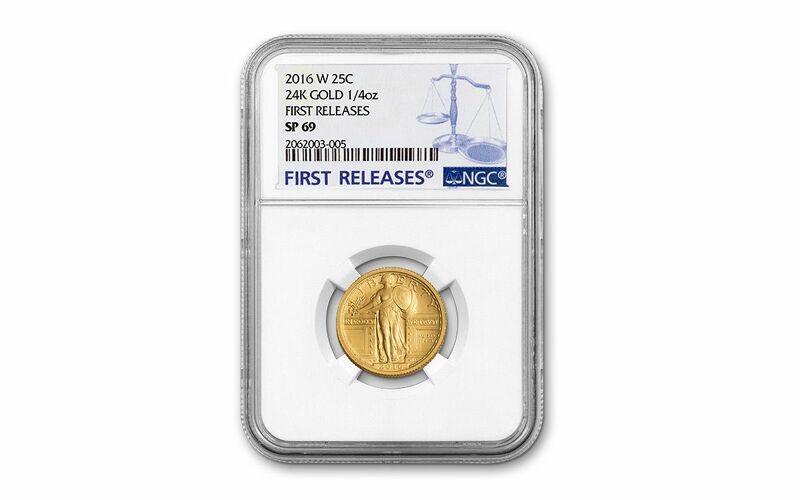 This piece of history will arrive to you graded as almost flawless Specimen-69 (SP69) by Numismatic Guaranty Corporation (NGC) and designated First Releases, meaning that your coin is among the first struck by the West Point mint and certified within the first 30 days of release. Your quarter will also come sonically sealed by NGC, preserving the coin’s condition without obscuring any of its detail. With a limited mintage of only 100,000 and an original limit of just one per household, supplies are already forecasted to be extremely tight. Quarters that come independently verified and designated First Releases will be even harder to find. Don’t let this temporary resurrection of a classic work of coin art get away – stop what you’re doing and order yours now!